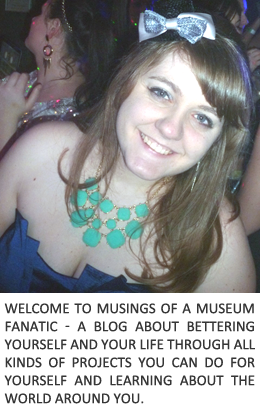 Musings of a Museum Fanatic: Ahhhh!!! I woke up about 10 minutes after I was supposed to head in for work. Ahhh! Since I didn't wake up with enough time I didn't get to prep for my afternoon crafting today. Cannot say more since it involves a certain someone's present : X So I'll have to do that after lunch it looks like. There have also been a few things that have popped up in work and personally that it's the drill sergeant mentality in my head. GO GO GO! Right now I'm still feeling that anxious omg what's going on next feeling. My brain feels like it's herding cats and is going all over the place. Must caaaaaalm down. Yeah that's not helping. Hopefully it will not continue to be "one of those days" Although hubby is coming grocery shopping with me tonight which always leads to oh so fun things *note the sarcasm ... I promise I will not kill him in the pasta aisle ... well I'll at least try not to! lol, I hope tomorrow is better! Too funny! Found you through a GFC Blog hop and excited to be a new follower! I hope you will stop by my site if you get a chance! Bahaha oh my goodness! We've all been there. Hope today is better!